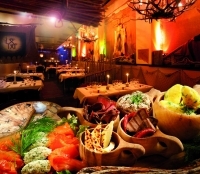 At the Lappish restaurant Saaga you will find a slice of the rugged nature and magic atmosphere of Lapland. We also bring the enchantment of Lapland to our guests in our service, interior decor and table settings, as well is in our food. The interior decor has the touch of Lappish artists and artisans. Dishes served on wooden platters, in kuksa wooden mugs, cast iron pots and ice provide a feast for the eye, as well as for the tongue. The pristine environment of the North creates an excellent place for wildlife and flora to flourish, so we use only pure Lappish and Finnish natural products whenever we can. We co-operate with several small producers to guarantee the good quality and specialized ingredients. The menu offers northern delicacies like reindeer, bear, Arctic char, Lappish cheese and mushrooms as well as cloudberries and cranberries. Welcome to experience the enchantment of Lapland - Buresboahtin! picked out the golden cloudberry. a taste of age-old knowledge and tradition. The whisper circled, searching for somewhere worthy of its message. a home of good cooking and more - a kindered spirit. This was where the whisper knew it would be heard loudest. a dash of Lappish charm and more than a pinch of Lappish taste. Thus was a new story born – the Lappish Restaurant Saaga.